There must be an infinite number of possible thoughts on any one piece of art, but we will only cover seven, a weeks worth. For 52 weeks, through 2009, you will see a work of art from the Portland Art Museum* and a riff each day inspired by it – prose, poetry, photos, video, thoughts or ponderings. View of Portland is the most recent of three Mark Rothko paintings to be loaned to the Portland Art Museum. Shortly after Christie's auctioned Homage to Matisse (1954), shown on the left, in November 2005 for $22m dollars it was hung in a corner of the first floor of the Jubitz' Center for Modern and Contemporary Art. Its corner "roommate", shown on the right (from a flickr photo with an unknown person), was another Rothko, also on loan. This yellow Rothko is said to have been loaned by Kate Rothko Prizel and was here close to a year after the opening of the Jubitz' Center. Prizel is Rothko's daughter from his second marriage to Mary Alice (Mell) Beistle who died six months after Mark Rothko's death in 1970. Both paintings were part of nearly eight hundred paintings in Rothko's estate at the time of his death. After the estate had sold them all at deeply discounted rates to a gallery in New York, Prizel and her brother sued the estate for fraud, ultimately winning and securing the return of all but one hundred paintings. Homage to Matisse was not one of them. It ended up in a vault until the Christie's sale in 2005. Prizel and her brother regret that it was not one of the paintings to come back since it was one they had grown up with in the family home as children. 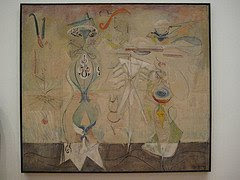 Why had Rothko kept Homage to Matisse with him after he finished it while choosing to store many others in his studios? Homage had a great deal of meaning for Rothko. He had painted it in 1954 the year Matisse died. 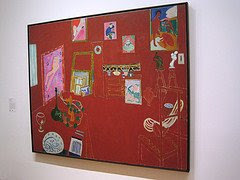 In 1949, the Museum of Modern Art began to permanently display Matisse's Red Studio. Rothko told friends that he credited Matisse with his understanding of color. "You became that color, you became totally saturated with it as if it were music". According to one friend visiting from Italy, he had told Mell: "You remember when I used to pass my days at the Museum of Modern Art looking a Matisse's Red Studio? You asked: why always that and only that picture? You thought I was wasting my time. But this house you owe to Matisse's Red Studio. And from those months and that looking every day all of my painting was born." .... Rothko's painting certainly had changed in the late 1940's. This was when he began to paint the large areas of color that he is remembered for the most, shifting from less figurative but more abstract paintings such as Slow Swirl at the Edge of the Sea, 1944. Both Kate Prizel and her brother Christopher Rothko remember Slow Swirl as the painting that their father worked on just after he met their mother Mell. It also had hung in their family home as they grew up as children. 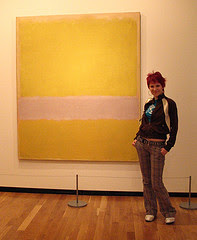 The Museum of Modern Art in New York received it as a gift from Mell Rothko's estate. Fifty Two Pieces is not affiliated with the Portland Art Museum.